Trizar® technology is based on the science of emissivity. This science measures a surface’s ability to emit thermal radiation. A common example used in buildings are Low emissivity windows that are treated on the outside to keep the sun from warming up your house during the summer reducing your air conditioning bill. High emissivity materials are treated on the inside of your windows to absorb heat and reradiate heat to increase thermal efficiency. Applying Low and High emissivity materials to fabrics makes them smart and thermo regulating for summer and winter applications. 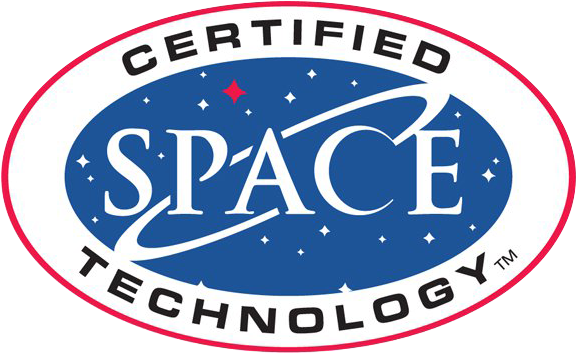 Products and services that display the Space Certification seal are guaranteed to have stemmed from or been dramatically improved by technologies originally developed for space exploration or to have significant impact in teaching people about the value of space utilization. Spacecraft destined for return to Earth, would need to withstand scorching temperatures during reentry into the atmosphere, caused by intense friction with the air due to their extreme speed during descent. NASA Ames Research Center scientists supplied the solution by inventing Protective Ceramic Coating Material (PCCM), which can be applied as a light, paper-thin coating to improve the performance of the ceramic tiles on the Spacecraft. The keys to the technology’s success is the high-emissivity, or heat-radiating agents contained in the mixture that decrease the amount of heat traveling to the underlying material. In addition, PCCM is resistant to mechanical damage and abrasion. Being that Trizar/ Emisshield (PCCM) is water-based and doesn’t contain solvents, it’s also environmentally friendly. Emisshield® material which was originally used by NASA to improve the performance of the ceramic tiles on space ships. Emisshield® materials are patented and designed to save energy while increasing efficiency in nearly all heat driven applications. Radiation is a form of heat transfer through which infrared rays transfer heat from one object to another without physical contact. The human body’s primary method for discharging heat is radiation. The skin is constantly radiating heat in all directions towards the objects adjacent to it, such as clothing or the surrounding air. The body can also receive heat from objects around it through radiation. Trizar® printed fabrics have been measured to absorb between 4 to 18 degrees Fahrenheit of Infrared (IR) heat more than a control. The printed Trizar® fabrics also increase emissivity and have shown to retain their performance past 30 launderings.